Synopsis (from Amazon): Super women ─ who are some of the most awesome women in history? Sheroes: Women hold up half the sky and, most days, do even more of the heavy lifting including childbearing and child-rearing. All after a long day at the office. Women have always been strong, true heroes ─ sheroes, oftentimes unacknowledged. As we shake off the last traces of a major patriarchal hangover, women are coming into their own. In the 21st Century, all women can fully embrace their fiery fempower and celebrate their no-holds-barred individuality. It is time to acknowledge the successful women of the world. Super women as female role models: From the foremothers who blazed trails and broke barriers, to today's women warriors from sports, science, cyberspace, city hall, the lecture hall, and the silver screen, The Book of Awesome Women paints 200 portraits of powerful and inspiring role models for women and girls poised to become super women of the future. Now is the time to acknowledge the greatness of women! One (or more) Sentence Summary: I love books that promote awesomeness. Add to that, women who have done amazingly awesome things in the past and you have a winner. 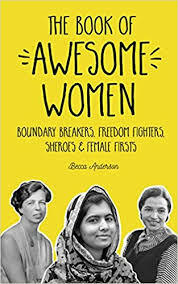 The Book of Awesome Women is something should be celebrated and shared with others (especially your kids, grandchildren, nieces and nephews). I was recently going through a what I will call a personal struggle; however, after reading The Book of Awesome Women, I realized my struggle was not real and I needed to move on. Thanks Awesome Women! This week bought a bracelet for an amazing friend with "She needed a hero, so she became one," etched on it. I have wrapped it up with a copy of The Book of Awesome Women. An awesome gift for an awesome women. I can't wait to give it to her next week. Becca Anderson is a writer, gardener and teacher living in the San Francisco Bay Area. Originally from Ohio, Becca s background in sustainability and landscaping inspired her to become a part of the seed-saving and seed-sharing community with chapters across the US and Canada. Becca Anderson credits her first grade teacher as a great inspiration and runs several popular classes and workshops including How to Put Your Passion on Paper. Anderson and is currently at work on a book about the healing power of gardening. Sir, thank you so much for you genuine spell,my wife is back!!! Thank you sir for your genuine spells. This is really incredible, and I have never experienced anything like this in my life. Before i met you Sir, i have tried every all probable means that i could to get my wife back, but i actually came to realize that nothing was working out for me, and that my wife had developed lot of hatred for me.. I thought there was n o hope to reunite with my ex wife and kids. But when i read good reviews about your work sir, i decided to give it a try and i did everything that you instructed me and i Trusted in you and followed your instructions just as you have guaranteed me in 48 hours, and that was exactly when my wife called me.. We are more contented now than ever. Everything looks perfect and so natural! Thank you so much for your authentic and indisputable spells. Thanks Sir for your help. If you need help in your marriage of broken relationship,please conatct Dr Jack right now for urgent help.